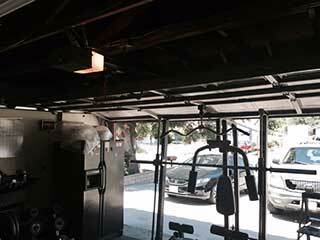 Unexpected problems with your garage door can really bring your day to a screeching halt. Aside from the inconvenience, they'll also pose a serious safety risk to you and your family, as using a garage door while one of its components is experiencing a malfunction is not only ill-advised, but also terribly dangerous. The best way to reduce the chance of an accident and increase the longevity of your overhead door system is to have it professionally maintained a couple of times a year. You'd be surprised how beneficial this type of service can actually be. Your garage door opener is in charge of automating the process of opening and closing your overhead door. When this unit experiences a problem, you won't be able to use your door remotely like you've grown accustomed to, and trying to do it the manual way may make you feel like you went back to the Stone Age. With our regular maintenance service, we'll be able to find foreseeable problems with your opener and address them well in advance. We'll also check the photoelectric safety sensors and see to it that they remain fully functional and able to detect an obstacle correctly. If sensor realignment will be required, our technicians will perform it on the spot. As perhaps the hardest working parts of any garage door system, the springs need some extra attention. Checking the condition of these components, lubricating their coils and adjusting their tension will be incredibly beneficial, especially when done on a regular basis. It will prevent your door from getting unbalanced, reduce the operational noise of the springs and increase their working efficiency as well. Both your garage door tracks and rollers need to be thoroughly examined. They help the door move in a guided way, and therefore must be in a great condition. Our technicians will lubricate the rollers to make them move more smoothly and examine the tracks for rust and bending. If we find evidence of damage, we'll take care of it on the spot by straightening the dents and removing the rust. If the condition is too severe, we'll replace the damaged tracks right away. To avoid having to spend money on costly repairs in the future, you should contact our experts at Garage Door Repair Delray Beach and schedule a maintenance appointment today. By having our technicians service your door on a regular basis you will help your system live up to its full potential.